Happy Halloween! And goodbye, October. Don't forget that Daylight Saving Time ends at 2 am this Sunday, so if you don't reset your clocks, you'll miss an extra hour of sleep. As winter approaches, site schedules see more changes, so it's always best to check ahead. And we have several state holidays in November, so we've provided a handy-dandy summary to help you keep track of who's open and who's not. Please note that these listings will be updated as I get more info. Nov. 15: Lecture—David Wenzel (former mayor of Scranton) and museum board member Kate Gibbons will present a program on Scranton-area women in WWI and WWII. AAAAAND there will be an ice cream social! 2 pm. Nov. 16: Lackawanna Audubon Society—Bill Speare's talk is entitled "Wildlife of Uganda and Kruger National Park." 2:30 pm. Nov. 29: Patriot’s Day—British and Continental troops, civilian reenactors, sutlers, and much more at this annual event commemorating the Battle of Brandywine and its significance to the American Revolution. 10 am-4 pm. Nov. 2: Fall Lecture—Site is open noon-4 pm; the lecture is at 2 pm. Nov. 22: Candlelight Tours—this annual program features living history, 18th-century music, and a chance to see the site by night. 6-8:30 pm. Nov. 2: Boone Birthday Program—celebrate Daniel’s 280th birthday with tours, storytelling, and cake (following Henry Miller's 2 pm presentation). Admission (includes guided tour): $6, age 13+; $4, age 5-12; Members get in free. Noon-4 pm. Nov. 9: Fall Lecture Series—Zachary Long will present "A Taste of the Eighteenth Century: The Original Farm to Table Cooking." 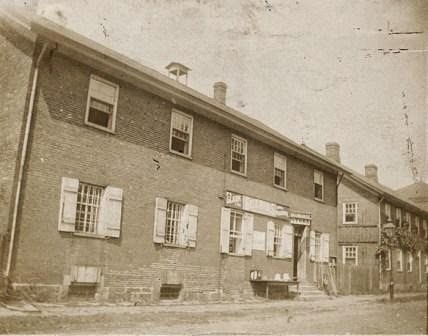 The program will explore the origins of popular Pennsylvania foods, the types of seeds and livestock available, and tools and techniques of cooking. Suggested donation: $2 (regular admission rates apply for self-guided and guided tours of the historic area). 2 pm. Nov. 16: Fall Lecture Series—Jim Lewars, Landis Valley Village and Farm Museum, will talk about "Rural Eighteenth-Century Pennsylvania Chairs," drawing on his knowledge of the Daniel Boone Homestead collections and those of the surrounding area (several pieces from Boone are included in Landis Valley's current exhibit, Chairs! Chairs! Chairs!). Suggested donation: $2 (regular admission rates apply for self-guided or guided tours of the historic area). 2 pm. UPDATED 11/5/14: this event has been postponed until spring.Nov. 13: Heritage Lecture Series—save the date and check back for details. 6:30 pm. Nov. 8: Tickets for Christmas at the Cloister—as of today, the general public can purchase tickets for this limited-seating event, scheduled for Dec. 8 and 9. Tickets are $6. Call 717/733-6600. Nov. 12: Storytime—preschoolers (with an adult) enjoy a story and take part in a related activity. Admission is $6 for an adult and one child (age 3-5), $3 for each additional child (free for Family-level members or with Family Museum Pass). 10 am. Nov. 16: Sunday Conversations—Nick Siegert will discuss the use of technology by members of the Amish community. Program is free, but regular admission rates apply to visit the site. 3-4 pm. Nov. 22: Making History Workshop—a little DIY, a little conversation, a little history. Make a small cross-stitch embroidery piece based on Sister Petronella's 1768 sampler. Cost is $15, $10 for members. 10 am-noon. Nov. 8: Little Mates Kids Club—tour the ship, have lunch with Captain Billy Sabatini, and get a kid-friendly behind-the-scenes peek at the museum. (Info on signing up, including how to join the Little Mates Kids Club.) 11 am. Nov. 18: Lecture Series—in partnership with S.O.N.S. of Lake Erie, the Museum presents Jerry Skrypzak on "Commercial Fishing on the Great Lakes." Free of charge. 6:30 pm. Nov. 8-9: Living History Program—250th Anniversary of the Return of the Captives, 10 am-5 pm. Nov. 29: A Soldier’s Christmas—see how soldiers have celebrated the holidays on the battlefront of different eras. Free admission. This year, Graeme Park will be collecting personal care items to send to servicemembers stationed overseas. Noon-6 pm. Nov. 1-2: Whitemarsh Encampment Reenactment—this long-standing event commemorates the Nov. 2-Dec. 11, 1777, encampment of Gen. George Washington and the Continental Army in the Whitemarsh Hills. Program details and discount coupon. Admission charged - $8 (age 18-59), $5 (age 6-17 & 60+), family rate is $20 per car, free for age 5 and under. 10 am-4 pm, rain or shine. Nov. 2: Heritage Day—costumed interpreters will be stationed in the house as you tour, Dr. Priestley will demonstrate chemical principles, and there will be games for children. 1-4 pm (chemistry demos at 1:30 and 2:30). Nov. 6: Hands-on History Day—experience seasonal chores, a one-room schoolhouse, hands-on crafts, and wagon rides. $10 per person (ages 5 and under and members are free). 10 am-3 pm. Nov. 8-9: Landis Valley Museum Store Holiday Open House—shop for locally handmade art, crafts and heirloom-quality gifts and enjoy holiday decorations in the museum store. Store event is free; regular rates apply for museum admission. 9 am-5 pm. Nov. 2: Philadelphia: The Great Experiment—meet executive producer Sam Katz, learn about Pennsbury's role in the making of the Emmy award-winning series, and view installments 6 and 7. Reservations required. 1-3 pm. Nov. 29: Wreaths & Greens Workshop—make a fragrant evergreen wreath and learn how to prune and care for evergreens in your yard. $35 fee. Choose morning (10 am-noon) or afternoon (1-3 pm) and bring your own clippers. Registration is required. Nov. 5: Friends’ Richard Koontz Memorial Lecture Series—“The Art of the Military Diorama,” with model maker Mike Siggins. Donation requested. 7:30 pm. Nov. 8: Kids Day II - Dress Up and Discover! !—Kids of all ages get to try on military uniforms from the museum education collection. Photo ops abound with three backdrops in the museum theatre. Visit the education stations in the galleries for more fun discoveries throughout the day. Parents must remain on-site while their kids participate in the activities. 10:00 am-3:00 pm. Nov. 22: "GAS! GAS! GAS! - The Terrible Weapon of the Great War"—Dr. Ron Lenox, retired organic chemistry professor and senior scientist at Armstrong World Industries, will talk about chemical warfare in World War I. Admission charged. 1:30 pm. Nov. 1-2: Trains & Troops—this annual program salutes our armed forces and explores the role of the military in railroad history (and vice versa). A Swing Dance Saturday night (separate or combo ticket) lets you enjoy big band music, refreshments, and swing, swing, swing. Program details. Sat., 9 am-5 pm; Sun., noon-5 pm. Nov. 2: Exhibit opening—"UnCommon Modern: A Pennsylvania Glossary of Midcentury Architecture" features a series of 40 color photographs by photojournalist Betsy Manning. Manning and exhibit curator William Whitaker, of the Architectural Archives of the Univ. of Penn., will be on hand to discuss the exhibit with visitors (more info about the exhibit). The exhibit will run through April 26, 2015. Museum admission is free today. 2 pm. Nov. 8: Annual Workshops in Archaeology—this year's focus is climate change and its impact on cultural resources. Contact Janet Johnson by Nov. 4 for a brochure (you can see part of it on Facebook). Nov. 8: Exhibit opening—the Pennsylvania Watercolor Society presents their 35th Annual International Juried Exhibition, which will run through Feb. 8. On Nov. 14, Karen Frattali, vice president of the society, will demonstrate watercolor painting in Village Square from noon to 1:30 pm (museum admission will be free from 11 am to 1:30 pm that day). Nov. 21: Hidden Treasures 3—a scavenger hunt for grown-ups, with food, live music, and adult beverages. Details and link to buy tickets online (online sales close Nov. 18). $30 per person, $55 per couple. 7-9 pm. Nov. 16: Afternoon Concert Series—this month's offering is 18th-century opera. Please check back for more details. UPDATE: Graduate students from Westminster Choir College will perform. 2 pm. 11/10/14: Unfortunately this event has been cancelled. There will be a concert in December! Nov. 23: Historical Lecture—Paul Nagy will discuss "Spies in the Continental Capital." 1 pm. UPDATE: the lecture will now take place at 2 pm. Now is the time to recognize historic properties or locations with statewide or national significance. 2014 marks the 100th anniversary of the state Historical Marker program (the first markers didn't look like the blue and yellow signs we use today). The postmark deadline for nominations is December 1 (details on the program and how to submit). 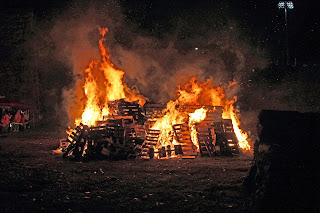 Anthracite Heritage Museum and Scranton Iron Furnaces has posted photos from last weekend's Bonfire at the Furnaces, and the Scranton Times-Tribune had a great write-up of the program and its representation of Scranton's rich ethnic history and traditions. The folks at Daniel Boone Homestead have shared photos of their Heritage Day celebration on Sunday, featuring the Bertolet Sawmill demos, colonial-era fly fishing, horse-drawn wagon rides (thanks to Landis Valley Village and Farm Museum), and much more. The restoration project at the George and Frederick Rapp Houses at Old Economy Village is wrapping up in time for a grand re-opening in early November. Curator Sarah Buffington's two most recent blog posts feature the installation of new replica carpet and the work to return artifacts to their proper places. The Pennsbury Society, the associate group at Pennsbury Manor, was recognized earlier this week by Foundations Community Partnership in Bucks County. They were among 14 non-profits cited for their work benefitting the county's children. Congratulations. The State Museum of Pennsylvania celebrated National Fossil Day last Wednesday, and you can read about it on Storify. 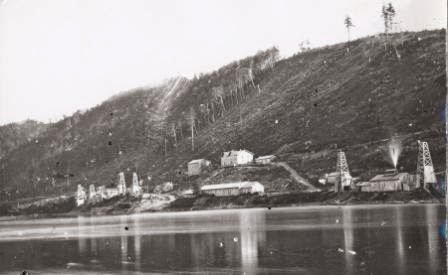 Oct. 26: Remember Johnny Mitchell Day—Admission ($5) includes presentation of A Miner's Tale. Museum is open noon-5 pm; the play is at 2 pm. Oct. 24 & 25: Haunted Homestead Tour—recommended for ages 8 and up. Admission charged (combo tickets with Sunday's program are available). 7-10 pm. Oct. 26: Halloween at the Homestead—there will be loads of activities for kids and their families, including trick-or-treating (costumes encouraged). Admission charged (see website or Facebook for info). Noon-4 pm. Oct. 25: Family Day and Oil Valley Blacksmiths—Included in museum admission. Museum open 9 am-5 pm (blacksmiths on site until 2). Oct. 24-25: Halloween Lantern Tours—this event is family-oriented but not recommended for children younger than 6. Admission charged. First tour leaves the visitor center at 6:30 pm, the last at 9 pm sharp. Oct. 24-25: Mysterious, Melancholy, and Macabre—this year's program draws from some of the classics of Gothic literature. Admission charged. Performances at 7 and 8:30 pm each night. Oct. 25: Gideon's Bones—geared for children 13 and younger. Admission charged. 1-3 pm. Info on both programs and images from Mysterious, Melancholy and Macabre. Oct. 27: Storytime at the Maritime—This month's story is Theodore and the Scary Cove. 10 am. Oct. 24: Moonlight Tales—see the Keith House by night and listen to spooky stories. Ticket sales begin at 6 pm, with performances at 7 and 8. Oct. 26 Mini-Moonlight—a family event geared for kids age 4-9. RSVP requested. 2 pm. Oct. 26: Family Halloween and Living History Theater—Family trick-or-treating and a presentation of the 1684 trial of Margaret Mattson, accused of witchcraft by some of her neighbors. Included in regular admission. 1-4 pm. Oct. 25: Historical Halloween—Trick-or-treating along lantern-lit pathways. Admission is $5 per car. Please bring canned goods for the local food pantry and an apple for the cider press. 5-8 pm. Oct. 24: Films at the Farmstead—tonight's feature is Hotel Transyvlvania. Admission charged. Movie starts at dusk (about 7 pm). Oct. 26: Lecture at the Visitor Center—Rick Wiggins will present a talk entitled "Embattled Farmers: Campaigns and Profiles of Revolutionary Soldiers from Lincoln, Mass., 1775-1783." Free of charge. 1 pm. Today's guest blogger is Kelly Westerlund, a senior at Robert Morris University. 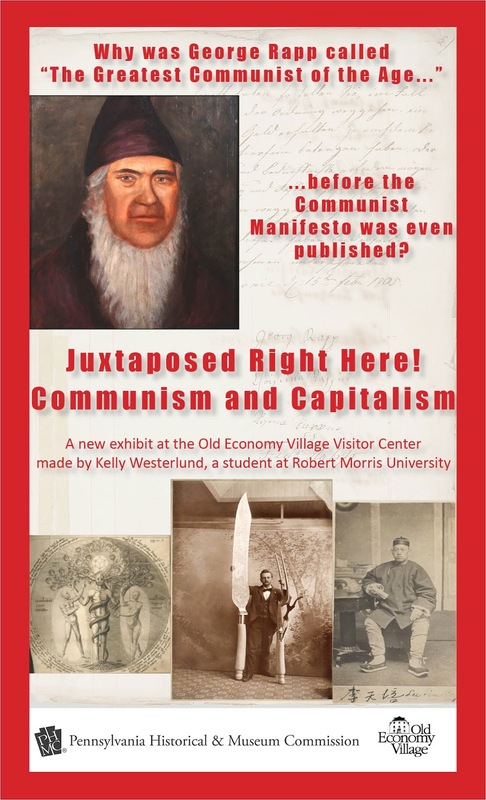 As part of her internship work with Old Economy Village curator Sarah Buffington, Kelly researched and developed an exhibit exploring the Harmony Society's economics and business practices. The exhibit, located in the lobby of the Visitor Center, will be on view through April 30, 2015 (or perhaps longer). With Halloween just around the corner, now is the perfect time to talk about something that frightens many Americans; that big, red monster called communism. The word for most people conjures up images of the Berlin Wall, Tiananmen Square, and children hiding under their desks to hide from nuclear fallout. It is a very scary word in American culture and has been for just about all of the twentieth century. Even now, calling someone a communist is meant to discredit them. We often think of communism as the antithesis of capitalism, but the Harmony Society proved this to be untrue in the late eighteenth through the nineteenth century. Their religious beliefs melded these two ideologies together as I demonstrate in my exhibit, Juxtaposed Right Here! Communism and Capitalism, located in the Old Economy Village Visitor Center. I chose to research this topic as part of my internship with the site. I was interested in how the Harmony Society managed to provide housing, food, education, clothing and any other necessities to its members throughout its existence and still build a massive fortune. 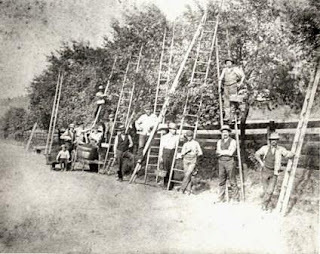 These amenities were even provided to their hired workers in addition to their normal wages. I concluded in my research that it was their religious principles that bonded communism and capitalism together. They needed to make as much money as possible to prepare for Christ’s return by operating and investing in capitalist businesses; but they also had to prepare their souls for Christ by living as equally as possible and sharing all the wealth they accumulated with each other. I thought I would find evidence of food shortages, rationing, and possibly even harsh working conditions like what we usually associate with communism. Instead I discovered that the Harmonists lived very comfortable lives. Even now we would envy the Harmonists! Currency did not exist within the Society so members only had to ask for whatever they needed whenever they needed it. Religion and compassion for their brothers and sisters kept them from taking more than they needed. The Harmony Society’s religious, communist principles were able to flourish because they used capitalism to make their money. These ideas are not mutually exclusive to one another and neither are they big scary monsters coming to destroy our country. It is important that we clear the fog and change the way we discuss communism and capitalism. 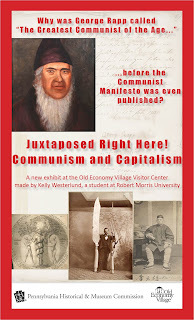 I invite you to come to Old Economy Village to check out my exhibit and learn about this amazing group that prospered with both ideologies working together. Most sites on the PA Trails of History will be closed Monday, Oct. 13, for Columbus Day, but please check the list to see which ones will be open for visitors. The October program listings were posted last week, and I will continue to update them as I get new information. This week's post is a selection of items that have come across my desk recently. I hope you'll find something new and interesting. And if not, I hope you'll have a good weekend anyway. I have not been following closely the development of the new Museum of the American Revolution in Philadelphia, but I did notice when I saw Facebook posts from two Trails of History sites related to the project. While the building is under construction, an elm tree will be cultivated and eventually planted at the museum as part of its opening ceremony (a couple of years from now, according to current plans). Soil from various Revolutionary battlefields, encampments, and other significant sites was collected to help nourish this modern-day Liberty Tree. Ephrata Cloister, which was the site of a makeshift military hospital after the Battle of Brandywine, and Washington Crossing Historic Park, where you-know-who crossed the you-know-what, both contributed to this collaborative effort. As Landis Valley Village and Farm Museum gears up for Harvest Days this weekend (Oct. 11-12), the local news ran a feature article about Clair Garman, who was the recipient of a PHMC Outstanding Service Award in 2012. He has been a volunteer at the museum since the 1950s and is particularly known for his wood-working skills. Making a return appearance to the Erie Maritime Museum's Hirt Auditorium, The Hardtackers performed a free concert on Saturday, Sept. 27. They filmed the concert for an upcoming DVD, which will showcase their renditions of traditional and contemporary sea shanties. The following song from The Hardtackers' YouTube Channel features images of US Brig Niagara. Most sites will be closed on Oct. 13 for Columbus Day, but please check the schedule for those that will be open. Oct. 18: Bonfire at the Iron Furnaces—experience ethnic traditions from Scranton's past and present, food, music, and a roaring bonfire. Visit the Bonfire Facebook page for ticket deals and updates. 6-10 pm. 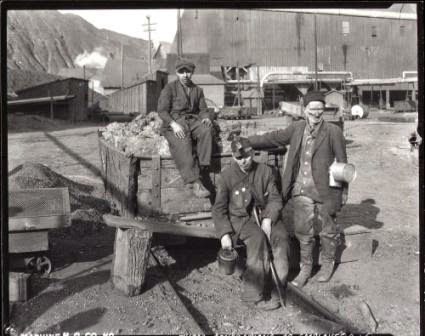 Oct. 26: Remember Johnny Mitchell Day—this annual event honors John Mitchell, president of the United Mine Workers of America during the anthracite coal strikes of 1900 and 1902. As part of the day's activities, Robert Thomas Hughes will present "The Miner's Tale," a theatrical production he wrote and regularly performs. Admission is $5 and includes the museum exhibits as well as the play. Museum is open noon-5 pm; the play is at 2 pm. Oct. 4: Fall Nature Walk—join Bushy Run volunteers and nature enthusiasts Bob Learzaf and Dave Browning to enjoy a walk and learn about the flora and fauna of western PA. Cost is $5 (free to members of Bushy Run Battlefield Heritage Society). 10 am. Oct. 18: Haunted History Hayride—Prepaid reservations are required; tickets are on sale now. Call 724/527-5584 to place your order (leave a message with name, phone number, and number of tickets requested). 7-10 pm. Oct. 5: Site open—it’s the first Sunday of the month, so the site will be welcoming visitors from noon to 4 pm. Oct. 19: Weiser Interpretive Sunday and Fall Park Walk—enjoy the beautiful Olmsted-designed park, as well as hourly historic tours of the site. Free admission. Noon-4 pm. Oct. 19: Heritage Day—this annual event includes craft demonstrations, hands-on activities, horse-drawn wagon rides, a program on fly fishing in the 1700s, and much more. Admission: $8 (age 13-64), $6 (age 65+), $5 (age 5-12) (Friends of Daniel Boone Homestead get in free). 10 am-4 pm. Oct. 24 & 25: Haunted Homestead Tour—this evening program will include Halloween-themed guided walking tours of the historic area; program is intended for ages 8 and up. Admission is $6; combo tickets include admission to the Oct. 26 program as well. 7-10 pm. Oct. 26: Halloween at the Homestead—there will be loads of activities for kids and their families, including trick-or-treating (costumes encouraged). Admission: $6 (age 13+), $4 (age 5-12) (Friends of DBH get in free). Noon-4 pm. Oct. 4: Drake Well by Moonlight—experience a special nighttime tour of the site, meet historical figures, and enjoy period music and seasonal refreshments. Tours last approx. one-and-a-half hours and cover about 1 mile, so please wear sturdy shoes and bring a flashlight (more details on the website). First tour starts at 6:30 pm, with tours departing every 10 minutes until 9:30. Oct. 25: Family Day and Oil Valley Blacksmiths—loads of activities for families and the last of the monthly blacksmithing meetings and demos for the season. Included in museum admission. Site open 9 am-5 pm (blacksmiths on site until 2). Oct. 10-11, 17-18, 24-25: Halloween Lantern Tours—tour groups walk through the 19th-century village and encounter funny, scary, and entertaining scenes (photos from previous years). Bring your own flashlight. (Info on rain dates and how to check for schedule changes.) Admission: $10 (age 13+), $5 (age 6-12); this event is family-oriented but not recommended for children younger than 6. First tour leaves the visitor center at 6:30 pm, the last at 9 pm sharp. Oct. 8: Storytime—preschoolers and their adults enjoy a story and a related craft or activity. Cost is $6 for one adult and one child (age 3-5), $3 for each additional child, and includes site admission as well. Free to Family-level members of Ephrata Cloister Associates (or you can present a Museum Pass from the Library System of Lancaster County). Oct. 10-11: Apple Dumpling Days—celebrate autumn, support the Back to the Cloister Fund (which helps to return original furnishings and objects to the site), and enjoy a wonderful Pennsylvania Dutch tradition. Saturday, Oct. 11, is also a Day of Music, featuring the Ephrata Cloister Chorus performing at 2, 3, and 4 pm. Site tours and Day of Music performances included in regular admission; no admission fee to purchase apple dumplings. 9:30 am-4 pm. Oct. 17: Community Days—this popular program is an educational open house, with learning stations scattered around the site. Students and their accompanying adults move at their own pace as they explore the activities. Admission: $6 for age 3-17; one adult admitted free with every 10 students; additional adults, $9 each. Reservations are strongly encouraged; call 717/733-6600. 9:30 am-1 pm. Oct. 17-18, 24-25: Mysterious, Melancholy, and Macabre—this year's program draws from some of the classics of Gothic literature. Advanced tickets (age 18+, $12; age 3-17, $10; discounts for ECA members) are recommended, call 717/733-6600. Two performances each night, 7 and 8:30 pm. Oct. 25: Gideon's Bones—families (you can come in costume if you like) can explore the history of Ephrata Cloister, gather clues, complete projects, and trick-or-treat along the way (please bring a small bag for treats). Geared for children 13 and younger; cost is $6 for one adult and one child, $3 for each additional child (free to family-level members of ECA). UPDATE (something I missed): Oct. 23: Special presentation on the Civil War Submarine H.L. Hunley—Jon Tirpak will speak about the history, recovery, and preservation of the Hunley, the first submarine to sink an enemy ship in combat (read more about it). The talk will be preceded by a cocktail reception. Tickets are $20 ($15 for Flagship Niagara League members); to reserve your spot, contact Andrew Adamus, 814/452-2744 x 225 or outreach@flagshipniagara.org. Oct. 8 and 15: Lunch and Learn Lecture Series—enjoy continental breakfast, a thought-provoking program, and lunch. Oct. 8 program is "To Normandy and Back Again," with Herbert F. Levy, AIA, speaking about his experiences in the Corps of Engineers in WWII and his recent return visit as part of the 70th Anniversary commemoration of D-Day. On Oct. 15, Kellee Green Blake, retired director of the National Archives, Mid-Atlantic Region, will present "They were Soldiers, Too: Researching Civil War Women on the Home Front." More details and a registration form are on the program flyer. UPDATE 10/07/14: per Graeme Park's Facebook page, this event has been cancelled Oct. 12: Brews, Blues and BBQ a new event featuring craft brews and ciders, food by Joey G's Deli, and music by Scoville Blues. Must be 21 or over to attend; advance ticket purchase recommended (no guarantee that tickets will be available at the door). See the program flyer for details. 1-4 pm. Oct. 24: Moonlight Tales—see the Keith House by night and listen to spooky stories. Admission is $15 per person (includes refreshments). Performances at 7 pm and 8 pm. UPDATE (I missed these earlier) Oct. 19: Site open—Hope Lodge will be open 12:30-4 pm, with guided tours at 1, 2, and 3 pm. Admission charged. UPDATE 10/20 - This event as been postponed, so stay tuned for a new date. Oct. 25: Hope Lodge Beerfest for Educational Innovation—visit the website for details. 1-4 pm. Oct. 11-12: Harvest Days—a classic special event and a great way to celebrate the coming of fall. Loads of demonstrations and activities for the whole family in a beautiful setting. Admission: age 12-64, $12; age 65+, $10; age 6-11, $8; free parking. 11 am-5 pm. Oct. 16 & 30: Hands-on History Days—children of all ages get to experience seasonal chores, hands-on crafts, wagon rides, and more. Admission: $10 per person (Landis Valley Associates members and children 5 and younger get in free). 10 am-3 pm. Oct. 18: Trades Workshop—this is an opportunity to learn about crafts and trades of the Harmonists and try your hand as well. Visit the website for details. 10 am-4 pm. Oct. 5: Historic Trades—your last chance for this season to visit the blacksmith and joyner as they demonstrate their skills with metal- and woodworking. Included in regular admission. 1-4 pm. Oct. 12: Living History Theater—you are invited to join Penn’s steward and housekeeper, John Sotcher and Mary Lofty, as they are united in marriage according to 17th-century Quaker wedding customs. Sign the wedding certificate and chat with William Penn and other guests. Included in regular admission. 1-4 pm. Oct. 19: Open Hearth Cooking—the cooks will have the oven fired up and the aroma of freshly baked bread will be everywhere. Included in regular admission. 1-4 pm. Oct. 26: Family Halloween and Living History Theater—enjoy trick-or-treating, traditional fall activities, and games. There will also be a living history theater presentation of the 1684 trial of Margaret Mattson, accused of witchcraft by some of her neighbors. Included in regular admission. 1-4 pm. Oct 11-12: 33rd Annual Fall Antique and Collectible Show—this semi-annual event supports the programs of the Lumber Museum, and this year includes a chance to see the newly renovated and expanded Visitor Center. Admission charged. 10 am-4:30 pm. Oct. 5: Garden Railways Tour—this event features outdoor model train layouts at private residences or retirement communities in Lancaster County. Tickets ($10 per person for ages 6 and up) may be purchased at the museum or at any Stauffer’s of Kissel Hill store in central Pennsylvania. The Garden Railways Tour flyer has more info; a map of participating locations will be provided with your ticket. 1-5 pm. Oct. 25: Historical Halloween—Trick-or-treating with a historical theme, following the site’s pathways by lantern light. Admission: $5 per car. Please bring canned goods for the local food pantry (UPDATE) and an apple to feed the cider press. 5-8 pm. Oct. 15: Learn@Lunchtime and National Fossil Day—explore fossils from the Mesozoic Era in the museum's "Life through Time" gallery with volunteer Sid Hostettler. Museum admission is free during the hours of the event. 11 am-1:30 pm. Oct. 17: Night of the Great Pumpkin—enjoy planetarium shows, creative pumpkin carving, storytime, crafts and snacks during this family-friendly event (UPDATE 10/9/14: press release has more details). Admission is free in conjunction with 3rd in the Burg. 6-9 pm. 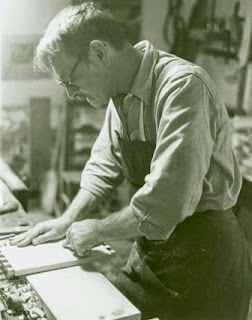 Oct. 5: Artist Reception—meet Pennsylvania artist Ed Kane, this month's featured artist in the Museum Store. He works primarily with watercolors, charcoals, and ink to depict historic structures throughout the Philadelphia region. 1-4 pm. Oct. 19: Afternoon Concert Series—"Practitioners of Musick" will perform 17th- and 18th-century music on the recorder and harpsichord in the auditorium of the Visitor Center. More info (including ticket prices) is on Facebook. 2 pm. Oct. 24: Films at the Farmstead—tonight's seasonally appropriate feature is Hotel Transvlvania. Bring your blanket and a picnic dinner and enjoy a movie on the lawn of the Thompson-Neely House (upper park). Cost is $5 per person for ages 5 and up; popcorn and other concessions will be available. 7-10 pm (movie starts at dusk). UPDATE, ADDITIONAL PROGRAM Oct. 26: Lecture—Rick Wiggins will present a talk entitled "Embattled Farmers: Campaigns and Profiles of Revolutionary Soldiers from Lincoln, Mass., 1775-1783." Visitor Center. Free of charge. 1 pm.